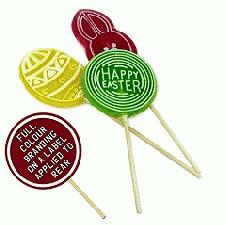 These fruit flavoured Large Promotional Easter Lollipops can be customised to taste, shape and even branding for your Company's needs this Easter! Choose your shape from a number of bespoke shapes other than just round or square, and have your Corporate brand-name and logo fully visible on both sides of the promotional lolly!! Personalise this logo branded Large Promotional Easter Lollipops and hand them out this Easter to celebrate with your Company branding on them! For a FREE QUOTE, please fill in the form regarding our Large Promotional Easter Lollipops and we'll be able to help you.